One of the most fascinating things about pool for me is watching the cue ball stop dead in its tracks. I have always been amazed when this happens, even though I know how to do it. Let’s look at this phenomena a little more closely and how it can help us win more games. If we hit the cue ball below the equator, it will start its journey with back spin. If the cue ball hits an object ball with this back spin full in the face, it will draw back from the object ball in the direction it came. After the back spin wears off, the cue ball will slide until friction causes the cue ball to start to roll. If the cue ball hits an object ball when it is sliding, and the contact is full, the cue ball will stop. Finally, if the cue ball hits an object ball with forward roll full, the cue ball will roll forward after contact. Frank Says: "“It’s hard to execute a stop shot if your cue has a crummy tip on it! Check out our huge selection of pool cue tips and find one that works for you!" We are interested in the case where the cue ball is sliding. The hard part about getting a cue ball to slide is that it is speed and tip position dependent. A lot of beginners always wonder why the cue ball doesn’t stop even though they hit it low. The answer is they didn’t hit it hard enough and the back spin wore off to roll, causing the cue ball to roll forward after contact. Learning how to get the cue ball to stop at varying distances is a good skill to have. You can hit the cue ball low and with a slow stroke, or high and with a harder stroke. In either case, you can get the cue ball sliding so that when it hits the object ball full on, it will stop. What we want to do first is hit the cue ball low and use a slow speed. We want to be able to stop the cue ball at a distance of one, two, three and four diamonds. Once we are able to stop the cue ball with a low, slow stroke, we want to learn how to stop the cue ball with a high and harder stroke. This diagram approximates the number of tips off-set below the center-line needed to achieve a stop shot at various distances with different stroke speeds. Take your time with this drill and master it. 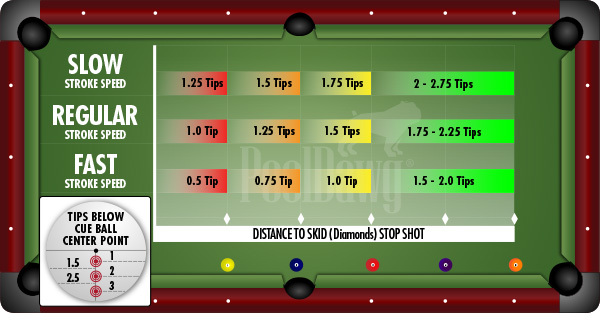 Once you have the ability to hit stop shots with varying speeds and distances, you’ll find that it helps pocket balls and move the cue ball to your advantage. Once you have mastered this controlled drill, throw some balls on the table and shoot stop shots. You aren’t trying to pocket balls, just shoot stop shots. Stay with this and you will have mastered the stop shot in no time.